In my last Awwation update I talked about the new CSS Themes support. This time, I’ve dropped the Canvas approach altogether since I discovered the <use> SVG element. <use> allows you to ‘href’ to an SVG element residing in the DOM and display a ‘reference’ to that SVG. You can also add overriding properties such as a viewBox and transforms. New awesome strip. Live, moving, 100% accurate snapshots. Now you can pick any element as a path node in the presentation timeline, and a snapshot of it as it exactly as it appears in the document, during the presentation, will be shown in the strip. How is this better than Prezi’s strip? Well, here, changes are reflected as they happen – so, if I’m moving an element around in the editor, you can see it moving around in the strip too! 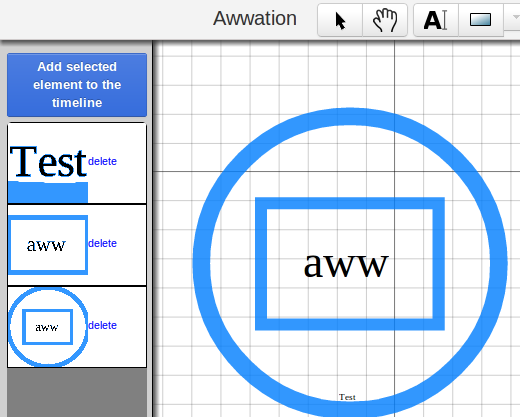 Last week, I blogged about how I wrote the first iteration of Awwation, an HTML5 Prezi clone. Somehow the blog post surfaced onto the front pages of Slashdot, and /r/programming for a couple of days, and the project got a decent following on Github (it was a trending repo that day!). This prompted me to polish the code a bit to make it presentable to potential contributors, and now the app is in a somewhat usable state. The first iteration was rather bland, so I thought it would be a good idea to have presentation themes like Prezi does. As it turns out, this was easy – SVG can be styled using CSS. Themes menu. Selecting a different theme instantly changes all elements in the document to the new style. What next? A theme creator tool would be a good idea. I’ve opened an issue for that. Contributions are welcome. 4. SVG and Fonts are not friends. Everything is supposed to be vectorized, but fonts aren’t handled that way. If you notice the animations in the example linked to near the end of this post, you’ll see that during zooming, the fonts ‘shake’ when resizing, because they don’t scale smoothly as normal vector content. The only way to achieve smooth scaling is to convert the text to paths, but that defeats the purpose of text accessibility. There is an SVG Fonts spec, which aims to remedy this by having each font glyph rendered using SVG paths, which would mean real vector fonts which can be selected with the mouse and handled as normal text, plus identical rendering everywhere. Webkit and Opera support this spec, but Mozilla and IE have outright refused to implement it, with the explanation being that WOFF is a ‘superior alternative’ or ‘enough’. This is quite wrong and their arguments are not satisfactory. WOFF is not vector content, and therefore can’t be (and isn’t) rendered identically everywhere. Period. Taking 1 and 2 as points in our favor, and tolerating 2 and 4, I chose SVG to be the superior but not polished-enough alternative. As it turns out, SVG-edit is an open source, completely client-side SVG editor, and perfectly suited for the task at hand. The editor. Incomplete, but it works. And here’s a link to the presentation shown above. Disclaimer: I haven’t done this one yet. 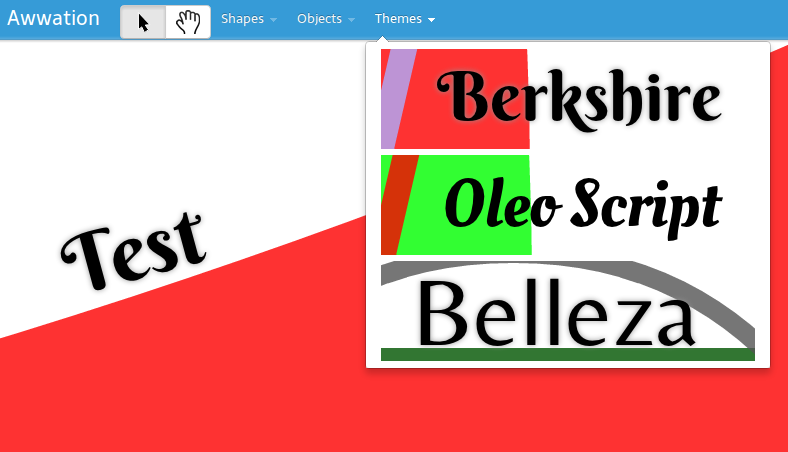 Prezi has a presentation themes collection. 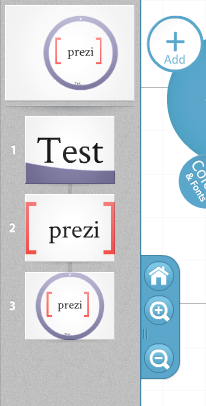 This is where Awwation can totally beat Prezi, and here’s how: CSS themes. SVG can be easily styled using CSS. WOFF fonts can be embedded as dataURLs in the CSS code. Anyone can create CSS files for this and you could have a huge user-generated corpus of themes! 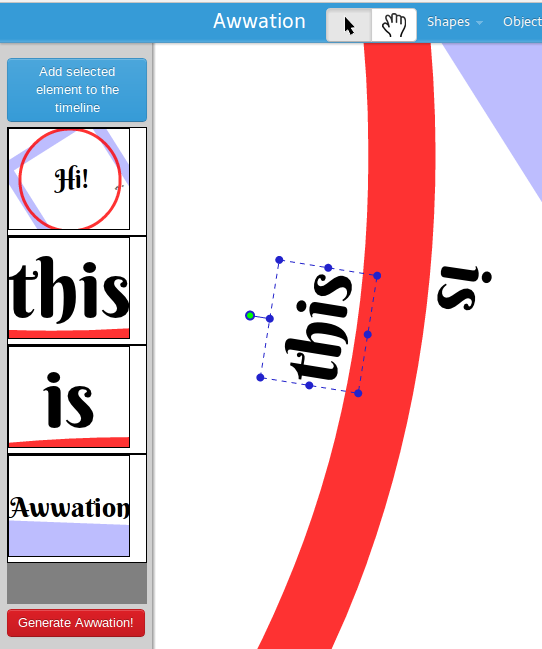 SVG-edit has already been extended to have real-time collaborative editing features using the Google Wave protocol. So Awwation can get collaborative editing for free! (once I or someone gets around to integrate it). Since we’re doing all the work client-side, we don’t want to send the created SVG to the server and then download it back to the client’s file system. We want it saved to disk right here. This would be the ‘normal’, convoluted way of doing it, but fortunately there is an implementation of the proposed HTML5 FileSaver API which allows us to save the file directly from the browser to disk. Unfortunately this works perfectly only on Chrome. With Opera/Firefox, you’ll have to save the generated file, rename it to .svg, and then view it in the browser. This can be much more capable than Prezi in terms of accessibility and extensibility. Holding it back are security policies and inconsistencies across browsers, which will hopefully have workarounds in the future. Here’s the project page for Awwation: http://adityab.github.com/Awwation/. Here’s a link to a sample presentation using Webfonts to make it look consistent across browsers: http://dl.dropbox.com/u/40496552/awwation-intro.svg. Warning: The presentation doesn’t work in newer versions of opera at the moment, here’s a relevant issue in Sozi. PS: I was inspired to work on this idea from Calligra Stage’s similar project.